Brooke Granovsky’s Multimedia Storytelling Blog: Welcome! The company’s newest member, Polina, takes on aggression in the battle scene. Watch as she translates emotion into movement in rehearsal. Then, see the full scene come together onstage, complete with blaring lights and a dancing opposition. In an interview, co-director and co-choreographer Hannah Schuster elaborated on the style of the battle scene. She emphasizes the theme of opposition in scene. This theme grew out of the choreographic process; as Schuster choreographed the scene, she alternated between the mice and the soldiers’ perspectives. In true dance battle style, for every move the mice make, the soldiers have an equal and opposite dance step. For instance, in the video below, the soldiers make a forceful push in the mice’s direction that sends the mice towards the edge of the stage. Schuster sees this move as the mice losing ground in the battle; this narrative translates physically as Clara, the Nutcracker, and the soldiers stretch over more of the stage, occasionally crossing in front of the mice. Polina and the mice take a moment to regroup, dancing slowly and in unison. Then, in one coordinated move, the mice aggressively jump up. Feet tucked, arms straight, cutting sharply through the air, their moment of retaliation arrives. While these movements read like genuine aggression and natural reactions, one would be remiss to forget how contrived and unusual this battle scene is in the greater context. As movement, the steps are much harder than Polina and the rest of the cast make them seem. Hours of choreography went into making the four minute scene, and the choreographic process started long before Schuster was sure that the show would be approved by places like Conference and Events and Student Activities. Still, more hours compounded during rehearsal and tech week. It speaks to Polina’s skill that she can juggle the scene’s demands. She executes the steps correctly, hiding all signs of the challenging physical demands required. In between considering head placement, foot articulation, spacing, and the narrative of the scene, Polina still remembers and successfully adds emotion to these technical elements. Hannah discusses how “The Nutcracker” is important to her as a Ballet Club member and as a dancer. Though she practices with only a few other people in rehearsal, the onstage version’s full cast clearly adds another element to the busy scene. In this clip, Hannah’s group is fighting a vicious dance battle against Polina’s group of mice. Hannah is representing the other side of the battle scene.Hannah’s red sash costume marks her as a member of Clara and the Nutcracker’s soldier army. The red lights respond in kind, shining and flashing on the soldier’s side of the stage. The effect makes the soldiers seem large, menacing, and imposing, hinting at who will prevail in the battle. Though the soldiers are ultimately victorious, at this point in the dance, the soldiers are pictured reaching out as they roll to their feet. They have been knocked down by a jump–in this version of the ballet, jumps are a mouse motif for aggression, notes Schuster. The soldiers’ response, stretching out their arms as they kick gracefully forward, signals their own motif. Like real soldiers, the battle scene soldiers use clean, calculated lines–embodied by reaching, kicking, and flowing steps. Schuster notes that theme steps or motifs are probably the only balletic trope to which the battle scene adheres. As a section of one of the most popular classical ballets, the battle scene’s modern choreography is the outlier of all outliers due to its absence of balletic repetition and its injection of hip hop influences. In classical ballet, repetition is everything. Even minor shakeups in this tool’s use have caused waves of traditionalist outrage. For instance, famed Russian-American choreographer George Balanchine shocked the ballet world in the 1950s with his timid suggestion that ballets could repeat steps three times, change the third repetition slightly, and still maintain the phrase’s classical integrity. The battle scene is the one scene out of the Ballet Club’s entire show that does not use repetition to some end. Schuster draws on Balanchine’s example as evidence that what she’s done to the battle scene will be accepted as classical (or more likely, contemporary) ballet eventually, even if it seems out of place today. Though dance battles are a common trope in hip hop, taking experience from hip hop is as far from a balletic trope as you can get. In classical ballet, dancers are not supposed to turn in their feet, flex their wrists, or move quickly without some underlying sense of fluidity. Polina, as a member of the mice cast, does all of these things in one sequence as she runs away from the soldiers. Hannah, as a member of the soldier cast, breaks similar balletic rules by combining fluidity with the things ballet bans, like legs rotated inwards and choreography on the floor. Backstage during tech week, Joanna runs through choreography for the snow scene. She notes that, for her, “The Nutcracker” is a yearly tradition that she wanted to continue in college. What look like simple movements become more complete with new spacing and classical costumes in the onstage footage below. The room Joanna dances in serves as the green room during the December 3 show. In the clip, the dance seems isolated and tranquil. This changes onstage. While the focus is still gathered around Joanna–her romantic tutu identifying her as one of two featured Snow Angels in the snow scene–the snow scene has one of the show’s larger casts that naturally pulls the focus away from any one dancer. The end of the scene, pictured below, was so crowded onstage and so challenging to perform in unison that Schuster decided to have dancers fade out of the choreography into frozen, icicle-esque positions. As one of the main roles in the scene, Joanna in the second last to freeze. There is no particular narrative in the snow scene. The scene unfolds as the Nutcracker takes Clara on a journey to his hometown, the land of sweets, to celebrate the pair’s success in battle. The snow scene introduces this celebration. The dancer’s faces–pleasant smiles all around–reflect the excited atmosphere. The abstract, slightly showy quality of their kick, jump, and turn-filled dance sequences mark the dance as more outwardly performative than the rest. The blue lights, fading peacefully between shades, maintain a sense of consistently and of place (place being fictional ice-filled land) that grounds the scene. While most snow scenes showcase the corps de ballet en mass en pointe, the Ballet Company’s snow scene does away with most of these french terms. Some of the featured dancers wear point shoes, but the choreography is more classically jazz than it is classical ballet. There are more pointed feet than say the battle scene, and dancers use balletic leg positions and arm positions to make static poses, but the casual and pedestrian steps in which these traditions link are anything but traditional. These videos show the extent to which the dancers are committed to their art. 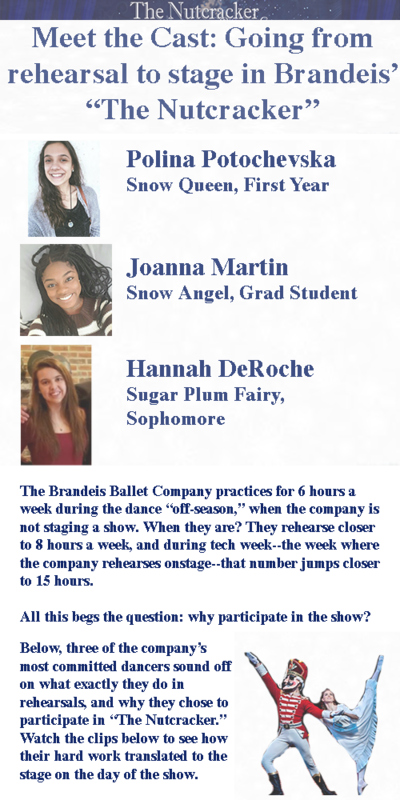 Polina seeks to bring emotion to it; Hannah underscores “The Nutcracker”‘s importance as a part of the Ballet Club’s activities; Joanna endows the show with memories of her childhood traditions. The videos also demonstrate two of Brandeis’ “The Nutcracker”‘s least classical scenes, illuminating how the show departs from time honored traditions such as repetition and take greater inspiration from classical jazz’s kicks, 1920s modern’s floor work, and modern hip hop crew battles instead. Quotes from Schuster and my own analysis reveal the logic behind these choices, and unpack the work that goes into making these seemingly-effortless four minute dances look polished. But one question remains: as a dancer, why do any of this? Schuster’s motivations are clearer–her answers reveal a careful reasoning that lends itself to the assumption that this is a personal project, one to which she has been committed for a long time, both in terms of dedication and in terms of sheer hours spent planning the show before it was even approved. For dancers, this choreographic, personal-vision-fulfilled element is less present. Polina, Hannah, and Joanna provide insight into why anyone would take on a project with such intense rehearsal and tech week schedules, and why these kinds of sacrifices might be worth it anyways. Post a pitch for your video story. Try to select a story idea that will lend itself to the video medium by provide opportunities for shooting action. This story will include multiple interviews, so please identify several potential interview subjects, as well as some questions you might ask them to tease out a story. Once again, your goal will be to evoke character, place, detail, emotion, and drama by asking who, what, when, where, why, and how questions. Try to address all five of these elements in your pitches. Try to get me excited this story and explain what makes it newsworthy: Who else do you think might be interested in it, and why? For my video story, I want to focus on the Brandeis Ballet Company’s ‘The Nutcracker.’ The production aims to be the first of its kind–Brandeis’ first full-length ballet. I will interview Hannah Schuster, the co-president, as well as cast members Polina P, Joanna M, Hannah D, Amanda E, Liza K, Frankie M, Lori S, and other dancers to get a wide range of perspectives on how the production aims to impact campus and how it feels to be part of Brandeis history. Interviewing dancers of all different class years will help represent different perspectives, and enable the story to relate to a wider audience. The audience I am appealing to is anyone interested in dance on campus, in the process of making art, or in how Brandeis’ extracurriculars are growing and changing. Prompt: Describe how you might draw on some of the material you have already shot (photos and/or video) to tell a new story in a multimedia format (images, text, and video clips). Describe how you would use existing material and what sort of additional material you might need to shoot. I have extra interview footage describing the process of choreographing and coordinating the production of the Nutcracker. Additionally, there is b-roll of the directors talking about what they have left to do, and of them planning rehearsals. This could translate into a short clip about the producing side of the show. Similarly, the “bloopers”-esque b-roll could help illustrate an audio clip from a talking head shot about how the rehearsal process is grueling, but still fun and goofy at times. Lastly, many of the dancers I interviewed talked about the difference between being in The Nutcracker at Brandeis and being in other productions at their home studios. A third video could combine this audio with b-roll of the speakers dancing, and highlight the dancers’ assessment of Brandeis’ Nutcracker in comparison to their hometown Nutcracker shows. Pitch #1: Environmental issues at Brandeis through the lens of BSF’s Cassie Cain ’18. Unknown to most Brandeis students, the University has a specific fund devoted to solving environmental issues and improving sustainability on campus. The Brandeis Sustainability Fund, or BSF, has been collecting $7.50 per student per semester since Fall 2011, and rarely receives more than one project proposal per semester. -and how she plans to impact sustainability on campus through the BSF. -and how the board plans to make the student body aware of BSF’s existence/abilities. Pitch #1: Underused club resources at Brandeis. Unknown to most Brandeis students, the University has two funds that students can use for club or independent projects. The Community Enhancement and Emergency Fund, or CEEF, can hold up to a quarter of a million dollars, and is currently full (and has been full for a year). The Brandeis Sustainability Fund, or BSF, has been collecting $7.50 per student per semester since Fall 2011, and rarely receives more than one project proposal per semester. In fact, almost all proposals coming from one class whose assignment is to make such proposals. Both funds have remarkably little oversight. I would like to investigate why students do not use these funds, and how the student representatives to these committees–Emma Russel for CEEF, Cassie Cain for BSF–promote and/or distribute funding. Pitch #2: Town-gown relations, specifically between Waltham police and unofficial Brandeis greek life. Students in Greek life often complain (and probably have always complained) about fraternity and sorority events being shut down early by police due to what these organizations see as undue security concerns. Frome one perspective, Brandeis’ suburban campus offers few places for students to congregate except for these houses. On the other hand, the greater Waltham community has a right to peace and quiet. At the same time, Waltham is deeply dependent on Brandeis, and thus on Brandeis’ students, for industry. I would like to interview members of the Waltham Police, as well as fraternity/sorority presents and Greek Awareness Council members, to investigate the diverse perspectives on this issue, and on the connection or dependency between Brandeis/Waltham. This story could interest members of Greek life at other suburban universities, police forces in other student-focused cities, the Brandeis administration and other Brandeis students. The press has the opportunity to criticize Clinton precisely because of her previous transparency, her openness to media, her government experience, her many interviews, which she gives all across the country. That the Times would forget the foundation on which their argument stands weakens the argument itself is worrying on several levels. This summer, Brandeis University announced that it would be reevaluating its general education requirements. An August 19 Hoot article noted that “[Dean of Arts and Science Susan] Birren said it has been over 20 years since Brandeis’ last ‘full assessment’” of the requirements, and a lot has happened in those 20 years. Most notably, Ford Hall and the current dialogue around the Black Lives Matter movement have spurred increasing consciousness about systemic racism on campus and the extent to which implicit biases are reflected in the general education requirements. Birren is working with survey data from students, staff, faculty and alumni to gauge the campus’ opinions on the requirements. With Harvard, Brown, and most recently Georgetown University making amends for their past and present biases, let’s hope that Brandeis can follow suit with a more socially just and inclusive general education curriculum. As a journalist, I am interested in balanced narratives. I think that the media often presents readers with only one side of a given story. I find it not only more fair, but also more interesting, to enrich stories with several different perspectives. A potential story lead that I hope to follow this semester is how students feel about the unique housing situation this year—specifically, how a larger than usual class of 2018 and class of 2020 are affecting housing, and how the Castle’s condition is affecting room availability on campus. Off campus, I am interested in town-gown relations, and how Brandeis police relate to students and student groups along South Street.